The field includes 38 of the top 100 and 17 of the top 50 in the latest Official World Rankings, with two players from the top-ten: #1 Dustin Johnson and #10 Jon Rahm. The other top 50 players are #12 Jason Day, #15 Paul Casey, #16 Patrick Reed, #17 Bubba Watson, #20 Webb Simpson, #23 Gary Woodland, #26 Sergio Garcia, #27 Louis Oosthuizen, #31 Rafael Cabrera Bello, #33 Keegan Bradley, #37 Tyrrell Hatton, #39 Henrik Stenson, #42 Branden Grace, #46 Brandt Snedeker and #50 Kevin Kisner. The field one includes 6 of the top 25 on the FedEx point standings for 2019. Those top-25 players in the field are: #5 Gary Woodland, #9 Dustin Johnson, #16 Paul Casey, #17 Kevin Tway, #24 Jim Furyk an #25 Lucas Glover. The event was not played in 2001 because of the 9/11 tragedy. A perfect way for fantasy golfers to check on the past performance of all the players in the Valspar Championship field is our performance chart listed by the average finish. Another way to check who is the best is through a special formula worked out in Golfstats that gives us the best average performances at the Valspar Championship in the last five years or check out our sortable 8-year glance at the Valspar Championship. The Valspar is one of those unfortunate events on the PGA Tour. Played on a great golf course, it doesn’t get the field it deserves, mainly because it falls the week after the Players Championship and right before the WGC-Dell Match Play. This year only 17 of the top-50 are in the field, three less than last year. Unfortunately, a lot of marquee names like last week’s winner Rory McIlory, Justin Thomas, Rickie Fowler and Jason Day are not in the field. Past champion Jordan Spieth isn’t in the field and last year Tiger Woods played and said how much he enjoyed the week. But it’s a shame to have a great sponsor on a great course and basically, the interest level is very small. Again we have talked about the new schedule with the Players Championship moving to March. This move has really put some heartache into the Honda and Valspar and there is very little that can be done. What I really would like to see is the Match Play, which is played in Austin Texas flip-flop with the Zurich Classic of New Orleans. That is the team event that doesn’t get many marquee names so by moving it to next week and moving the WGC-Match Play to April would help events like Honda and Valspar. So how successful were the Players in March? I would say it was very successful. The course is one of the best in golf and it was set up perfectly. Unfortunately, the week saw very little wind and with rain on Saturday and Sunday morning if made the course play very soft. I just can’t wait for the one time when they get no rain and winds from 15 to 25 mph. Still, I have to say the PGA Tour has done a great job with the course setup and it’s just a notch below the iconic level that Augusta National is for the Masters. Can you imagine how good Rory McIlroy would be if he could putt? Not only did Rory miss 6 of 17 putts between 5 and 7 feet, but he also missed 5 of 8 putts in the 8 to 10-foot range. 80 players participated over 4 rounds at the Players and McIlroy was T-61st in putts inside 10 feet. Now we have talked about this for the last couple of months, that Rory has not put that great and if he was to get it together god only knows how good he would be. One thing that we can easily say going into the home stretch before the Masters, Rory and Dustin Johnson are playing the best and we have to think that both of them will be in serious contention come the back nine on Sunday at the Masters. I know the world rankings only have him 4th, while Dustin is 1st but I would have to think by the end of the Masters, Johnson, and McIlroy will be the top-two players in the World Rankings. Both will play in the Match Play and both have won it before so you have to think that they will be around for the weekend and will be going into the Masters with all cylinders clicking away. At the same time you can’t forget about Justin Rose, he did sneak into a T-8th at the Players. One person that is getting a bit of scrutiny is Brooks Koepka. Since his great play over the summer when he won the U.S. Open and PGA Championship, Koepka put a cherry to his year with a victory at the CJ Cup in South Korea. After that Koepka has scrambled, yes he was T-2nd at the Honda but that and a T-9th at Abu Dhabi has been his only top-ten in his last nine starts. He played terribly and missed the cut at the Palmer and then barely made the cut at the Players only to finish T-56th. Many have wondered what is up and Golf Channel’s Ryan Lavner had a report that since November Koepka has been on a diet, losing 22 pounds going from 212 to 190. With that, he has lost a few yards off the tee and many are starting why a person as fit as Koepka would want to lose weight? Seems that Lavner guesses that the reason is ego, that Koepka is going to be a part of ESPN Magazine’s annual body issue and that it seems the photo shot is over so Koepka can now come off the diet. Thanks to Jim Furyk’s runner-up finish at the Players, he climbed 110 spots on the Official World Golf Rankings and is 57th. He couldn’t have picked a better week to accomplish the climb up the rankings because he is now invited to play in the WGC-Dell Match Play Championship. There is a dirty secret in golf and that is if you can maintain a spot in the top-50 of the world rankings, you will have a terrific year because you get to play in all of the majors and WGC-events. Furyk is probably happy to play in Austin, but you know he has another move in mind, that is into the top-50 of the rankings after the Match Play. If he can achieve that, he would get a return journey to the Masters, which he has played in 20 times including four top-ten finishes. Furyk last played in the Masters in 2017 and would probably love to have another chance to play in the Masters. Now with Furyk getting into the top-64 and getting to play at Austin next week, the bad news was that someone was replaced and that was Satoshi Kodaira who went from 61st to 65th. After winning the Golf Nippon Series Cup in December, Kodaira looked to be a guarantee for the Match Play since he started the year 46th in the rankings. But in eight starts he has only made three cuts and his missed cut at the Players doomed him. One good thing, his drop in the rankings won’t affect him playing in the Masters since he got in when he won the RBC Heritage last year. This will be the 19th Valspar Championship, with the first one played in 2000. The tournament was formally called the Tampa Bay Classic and then changed in 2003 to the Chrysler Championship. Chrysler dropped out in 2006 and PODS took over sponsorship and got an added boost with the advent of the FedEx Cup series and the transfer of the Players Championship to May. So in 2007, just six months after the close of the 2006 event the tournament moved into it’s new March date. But that didn’t last long as with a change of management at PODS; they left after the 2008 event. The power of the PGA Tour shined through as Transitions Lens, an optical lens manufacturing company, whose headquarters are in the Tampa Bay area, came to the rescue with a four-year deal but unfortunately, that deal came to an end after the 2012 event. They got EverBank to write off some of the expenses in 2013 but for 2014 got their sixth and present sponsor Valspar, a company that is paint and coatings manufacturers. The 2001 event didn’t happen because of the 9/11 tragedy. When the tournament first started in 2000, it was the first time that a full PGA Tour event was held in the area since the St. Petersburg Open, held between 1930 and 1964. The course was the home of the mix-event JCPenney Classic, which ended in 1999. The course has a 76.8 rating and slope rating of 144 from the championship tees. The course is part of a resort and is open to those that stay at the course. It also sells local memberships. The course has 63 bunkers and eight water hazards in which six holes have water in play for the professionals. Larry Packard designed the Copperhead course and opened in 1974. It was restored in 1999, two years after Westin Inc. purchased it. The goal of the restoration project was to regain the shot values and still challenge today’s longer-hitting PGA Tour players when Innisbrook hosts PGA Tour events. The plan involved refurbishing all 18 greens, restructuring many of the bunkers, removing some trees around the greens to improve air movement and sunlight, and clearing out undergrowth between fairways. The length of the golf course is the most visible change from 7,087 to 7,230 yards by the addition of tournament tees on five holes. Since then minor renovations have added another 110 yards to the course, bringing the final yardage to 7,340. 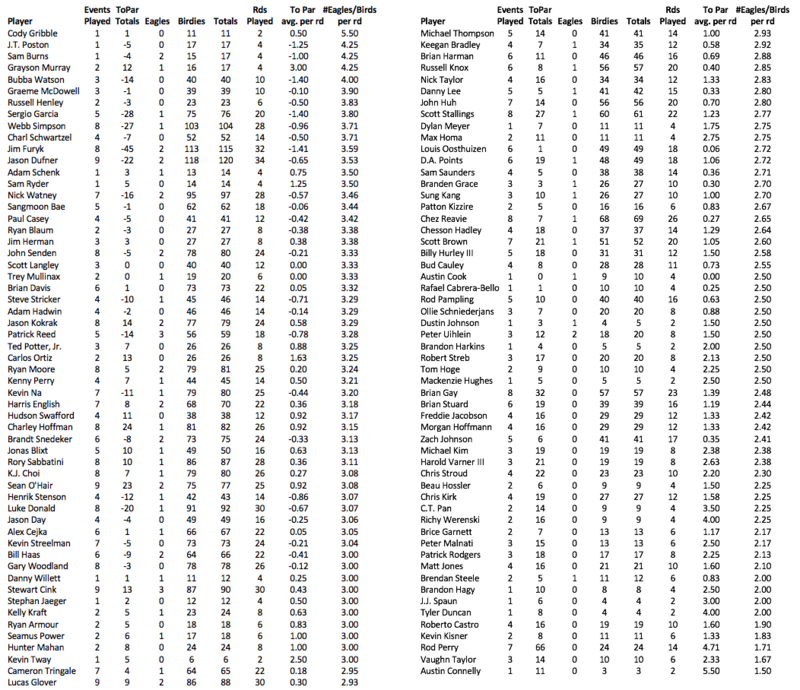 This is based on the most important stats for Cooperhead Course, based on data from last years Valspar Championship, and using data from all the players in the field with stats from 2019. What we do is take their rank for each stat and then add up the four categories. The scoring average of the field at Cooperhead in 2018 was 71.97, so with par being 71, that means the average score was just a shade under one shot per round, making Cooperhead the 6th hardest course to score on in 2018. One of the reasons the course played a half a shot harder than the 71.51 average in 2017 was due to it being windy all four days, with Thursday seeing gusts up to 30 mph. On Friday, Saturday and Sunday wind speeds were clocked at between 10 and 15 mph It’s also important to see how weather plays a factor, as the wind also blew in 2015 and the average was 72.88 (3rd hardest), in 2014 the average was 72.59 (10th hardest) and in 2013 it played at 71.91 making it the 12th hardest course on tour. So historically the Copperhead is a challenging course to start with, add some wind and it’s a brute. Now the good news for the week, winds will under 10 mph each day with temperatures in the mid-70 so look for scoring to be easier this year. In looking at the stats for Cooperhead last year, Greens hit, Driving Accuracy and putting from 4 to 8 feet were important. So our first stat is Strokes Gained Tee-to-Green because of the fact that last year the course ranked 15th in driving accuracy and 3rd in greens hit. Last year’s champion Paul Casey was 6th in Strokes Gained Tee-to-Green as he was T-68th in Driving accuracy and T-30th in Greens hit. Showing how important greens hit is, of the players who finished in the top-four, 3 of them were in the top-ten of greens hit with 4th place finisher Sergio Garcia finishing 2nd in greens hit. So with it important then it’s important to get it close to the hole from the fairway. Last year the Cooperhead course was T-11th in Proximity to the hole while Casey was T-22nd in our second stat. Our third stat is Strokes Gained-Putting because of the importance of putting well at Innisbrook. The greens are average size and don’t have much undulation, so players can do well on the greens. Last year the field finished 44th in overall putting average meaning that only 7 courses on the PGA Tour had better putting numbers than the Cooperhead course. Last year’s winner Hadwin was T-1st in overall putting average but in Strokes Gained-Putting he was 15th. Last we have Par Breakers as the course was the 3rd hardest course on the PGA Tour to get birdies and eagles. This is one of the reasons the scoring average is high, players just can’t make a lot of birdies or eagles. In looking at the comparison, there is 15.48 average in Par Breakers at Innisbrook, at the Plantation Course at Kapalua that average is 25.16 But that wasn’t a problem for Casey as he ranked T-3rd with 15 birdies so he was T-5th in Par Breakers. *Strokes Gained Tee-to-Green: This is a good indication on players that do the best at hitting it far, straight and then hitting lot’s of greens to pick up the most strokes by perfecting those combined stats. *Strokes Gained-Putting: No matter how good your game is, you have to make these putts in order to win. This stat takes into effect everything that happens on the greens and calculates the number of shots either gained or lost. *Par Breakers: The course is so demanding that making a lot of birdies and eagles aren’t possible. So players that are able to make a lot will do well on this course which ranked 6th in this stat on tour in 2015. This is a tough tournament to gauge because of a lot of different reasons. First, it’s not one of those events that historically players attend, a perfect example of that is Jordan Spieth who won the tournament in 2015 but didn’t play in it the last couple of years. Then you have the weather, winds play havoc to scoring, and there is going to be wind on Thursday and Sunday. Also if it rains, that brings in another factor, picking a player that does well in the wind. So let’s look at our top players, first off is Dustin Johnson at $11,500, have no idea why he added this event to his schedule. I say that because he has only played twice and missed the cut both times and this just doesn’t seem the type of course for him. So despite his good run of late the last thing you want to do is spend a boatload of money on someone that could be challenged by a course. Now Jon Rahm at $11,000 is a good bet, he hasn’t played the course but I feel it suits his game and after his good finish at the Players will produce again in this event. Jason Day at $10,700 is another player to scratch your head over. On paper, he should be good on this course but in six starts his best finish was T-20th in 2012. That along with his back which I still think is a ticking time bomb makes the decision easy, it’s best not to choose him this week. Now your best favorite is Webb Simpson at $10,400. Has a good past in this event and produces good offensive numbers so he is a great choice. Sergio Garcia at $10,100 is also a very good pick, he was 4th last year and does make his share of birdies and eagles on this course. Your tossup player is Gary Woodland at $9,900. Yes, he won the event in 2011 but has struggled ever since he also hasn’t played that great in Florida to take a pass on him. Paul Casey at $9,700 is your defending champion and the course is perfect for him. I can go in either direction on him, he missed the cut at the Players but was T-3rd in Mexico. So I can’t go in any direction since he is the defending champion I will take a pass on him. Patrick Reed at $9,500 is a great choice, he plays well on the Copperhead course and in the past seems to get his season going in March, he hasn’t played great this year but it’s not bad. One thing that has hampered him this year is the weekend, so watch that but he is probably a good pick. Keegan Bradley at $9,400 is a lot of money for a guy that doesn’t play that well on the Copperhead Course, his record for the year isn’t good enough to cover his high price so take a pass on him. I am also puzzled at the high price of Louis Oosthuizen at $9,300, I just don’t see it and have to say he is an easy no for the week. Jim Furyk at $9,200 is on paper good since he plays Copperhead great and was runner-up last week. Just have to wonder if he still has four rounds in him, still, he plays well in this event so ride the train with him this week. Henrik Stenson at $9,100 is too much money for a guy that has been very inconsistent this year. Lucas Glover at $9,000 seems good because of his play for the year, but he hasn’t shown much on the Copperhead course so I say no for him. The first decision is Ryan Moore at $8,700 is a good chose, his game has gotten better and he plays well on the Copperhead course. Kevin Kisner at $8,500 is a good gamble based on his game coming around, just has to put together 4 good rounds. Same with Brandt Snedeker at $8,400, his game seems to be coming around and he will be worth the price. Branden Grace at $8,000 is a good price for a player with a good record in this event. Tyrrell Hatton is at $7,900 and despite him never playing in this event think he will do fine. Absolutely, positively, you have a lot of choices in the $7,500 and under list. First one is Graeme McDowell at $7,500, he is playing good and has done well on the Copperhead course. There is a reason why Steve Stricker is playing this week and at the price of $7,400 is worth it. Seems to make the cut, yes he won’t make many eagles and birdies but will play all four rounds. Another player at $7,400 that is worth the price is Joel Dahmen who is playing for the first time in this event but played well at the Players. One person that could surprise a lot of folks is Brian Harman who is $7,000 and even though his record isn’t that great at the Valspar, he played great last week at the Players so take a gamble on him. I normally don’t pick him but Rory Sabbatini is $6,900 and played well in his last couple of starts and played well at the Valspar last year. In looking at the 18 champions of this event, eleven of them have this in common. They were in the top-12 in greens hit. Matter of fact five of them was in the top-five while Gary Woodland in 2011 ranked T29th and Luke Donald was T43rd in 2012. In 2013 Kevin Streelman was T11th in that stat, while 2014 champion John Senden was T3rd in greens hit. In 2016 Charl Schwartzel ranked T-10th in greens hit, and last year Adam Hadwin was T-5th. So it is crucial to hit lots of greens, and for those that do, they usually have an advantage. This event is one of the hidden gems on the PGA Tour. Played on a great course, unfortunately, it’s in the wrong time between Players and the Match Play to get a great field. One thing for sure players respect the course and show up, of its past champions all active players (except for Jordan Spieth) are in the field. They played this event in October until 2007, and the change hasn’t made much of a difference other than the rough is a bit healthier now. Accuracy is more of a premium at Copperhead than length. This course can’t be overpowered like many other courses like Bay Hill a couple of weeks ago. Stats that prove this is first driving distance averages, in 2018 the average of all the drives in the field was 275.6 yards, the 4th lowest on the PGA Tour. Since 2005 it’s been in the bottom six every year as the shortest driving average course. So it only makes sense that when you look at the champions, the only real long drivers were Gary Woodland in 2011 and Vijay Singh in 2004. All the others were in the middle to back of the pack in average driving distance; so this is the one course that short hitters can do well on. Maybe it’s no coincidence that players that hit it long took this week off as of the top-20 in the driving distance stats for 2019, only nine are in the field this week: Bubba Watson-2nd, Wyndham Clark-4th, Brandon Hagy-6th, Grayson Murray-9th, Ollie Schniederjans-11th, Gary Woodland-12th, Seth Reeves-14th, Cameron Davis-18th, and Kevin Tway-2oth. Another important stat is putting, and the greens at Innisbrook are some of the hardest on the PGA Tour because of the undulation and grain on the greens. Last year it was the 19th hardest course to make putts between 4 and 8 feet, with 68.68%. In 2017 it was the 22nd hardest with a 69.47%, in 2016 it was the 9th hardest with a 67.06, in 2015 it was the 2nd hardest course with 64.25. In 2014 it was the 3rd hardest course to make putts from 4 to 8 feet while in 2013 it ranked 6th. In putts inside 10 feet, it ranked 26th last year, 9th hardest in 2015 and 4th on the PGA Tour in 2014. All the par 5s is within reach of the average player, and though the course is over 7,300 yards, it won’t present much of a problem. Look for lots of par 5 greens to be hit in 2. The average of all the champions on the par 5s is just a notch under 8 under In 2012 & ’13 both Luke Donald and Kevin Streelman were 9 under on the four par5s, while in 2014 John Senden was 7 under. Jordan Spieth played the par 5s in 7 under in 2015 and Charl Schwartzel was 9 under on the 5s in 2016. In 2017 Adam Hadwin played them in 6 under par and last year Paul Casey was 8 under. Look at all these facts, and you can conclude that good ballstrikers rule the roost at Innsbrook. This is not your typical Florida type of course because the fairways are tight, the rough will be tall. One oddity that you don’t see in most events is the fact that you don’t have many players that shot four rounds in the 60s. Of the 15 champions, only four have accomplished that, in 2002 with K.J. Choi, in 2004 with Vijay Singh, in 2010 with Jim Furyk and 2011 with Gary Woodland. Another oddity along this line, in the history of this event only 52 times has someone broke par four times during the week. Last year Tiger Woods was the only player to do it. In 2017 four players did it while in 2016 nobody accomplished the feat. In 2015 Jordan Spieth was the only player to complete the achievement. Making this stat odd is the fact that only 11 times has anyone broken 60 all four rounds, the last time that happened was in 2012. The last seven winners have been gone on to have great seasons as they have finished the year of their win inside the top-30 in FedEx Cup standings, with 2010 champion Jim Furyk and 2015 champion Jordan Spieth winning the FedEx Cup title. Weather is always of interest, especially the forecast of wind that makes the course play hard. This week there will be no rain but the wind won’t be blowing, the highest day is Thursday at 11 mph, the other three days will be under 9 mph. Makes sense to choose him, great ballstricker that has played great at Innisbrook and is playing well and been very consistent in 2019. Just like Garcia, the course should be perfect for him despite never playing it before and coming off a great week of ball striking at the Players. Don’t laugh, has all of the stats for the year and has a good record on this course, I think that at 48 and on courses like Innisbrook or Hilton Head he can win again. Guy is great from tee-to-green and has won at Innisbrook, only problem is he has struggled of late but one good session on the driving range can fix that. Another of those that have put up good numbers in Strokes Gained Tee-to-Green, Putter and Par Breakers, he showed last year that he could play the course. He could be the sleeper pick, haven’t heard much about him but he is deadly on this course and could sneak into a win. Defender that loves this course. His game is coming around and he should do well this week. A good ball striker that should have a great week on this course. His game is getting better and he could surprise us this week. His game has gotten sharper, great from tee to green only problem is his putting. Played well on this course last two years does make a lot of birdies. His game is better now, that is a good sign because in past years when he is playing well he does well in this event. Another of those that is great from tee to green but can’t putt, but is playing great right now. Was T-8th last year and T-7th in 2015 so has played well at Innisbrook, his game has been solid in 2019 so he is a great pick. Another player that did well last year at Innisbrook and been good in 2019. Always watch him, Innisbrook is perfect for his game. It’s a mystery to me why he is playing this week, the course doesn’t suit his game and I just don’t think he will have a good week. It’s a toss-up for him, he has never played well on this course and I am still worried about his back. Who knows maybe he just wants to see if his back will hold up, but I just don’t think Innisbrook is good for him.